Michael Michaud Jewellery is a world-renowned brand with expertise in creating botanical jewellery. Their unique pieces capture the beauty of nature in exquisite detail. Michael Michauds interest in nature and the floral paintings of Van Gogh come together in this exclusive collection. This pendant necklace is made from soft patinas on bronze accented with gold leaf and semi-precious stones. This piece is handcrafted and cast from an actual plant, using a technique similar to lost-wax casting. 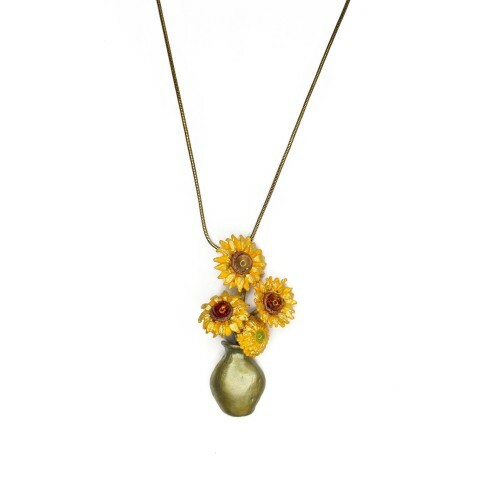 The Sunflowers pendant is cast in bronze with flowers of yellow enamel and gold leaf, accented with ambers and peridot. Measures: Chain: 24" L (+1" adjuster); Pendant: 2.25" L.